Self-Realization Fellowship has come into the world to draw souls to God through their own expanding Self-realization. SRF brings a step-by-step ladder of Self-realization that is universally true, scientific, and capable of leading mankind in the quickest way to the goal of eternal happiness. Practice of SRF teachings reveals, right within one's own being, the spinal highway of Self-realization whereon all paths of religious beliefs meet; the royal way of yoga meditation that leads straight to the abode of Infinite Bliss. Those who know the technique of God-communion can find Him also in the company of other devout spiritual persons who know the secret of meditation. Many persons who believe themselves to be followers of religion are unable to commune with God. Fellowship with such religionists boosts only unrealized beliefs about God and about the spiritual life; sometimes it ends in theological warfare. But when one who has discovered the universal way to freedom communes with God by scientific, continually progressive methods of meditation in the company of other deeply meditating devotees, he develops Self-realization through mutual help. Until we associate with those who have seen, felt, and realized true religion in their lives, we may not fully know what religion is and in what way it is universal and necessary. From time immemorial in India, seekers who were truly eager to realize God have sought association with saints, or have meditated on their pictures in the company of other spiritual aspirants. There is a deep spiritual reason for this practice, which has been endorsed by the masters for centuries. Many temptations to revert to wrong habits, haphazard thinking, and restlessness beset the beginner-yogi. The delusive force of maya is powerful and difficult to overcome, especially at first. Thus, those who wish to perfect themselves are urged by the masters to keep in close association with others of similar nature in order to strengthen their right aspirations. We become like the people we mingle with, not only through their conversation, but through the silent magnetic vibration that emanates from them. When we come into the range of their magnetism we are affected. If a man wants to become an artist, he should associate with artists. If he wants to be a good businessman, he should associate with successful leaders in the business field. If he wants to become a spiritual giant, he should associate with devotees of God. The aim of Self-Realization Fellowship centers is communion with God. You do not know how much it pleases the Father when devotees gather in His Name. In India devotees may build no edifice; they come together anywhere to meditate upon Him. 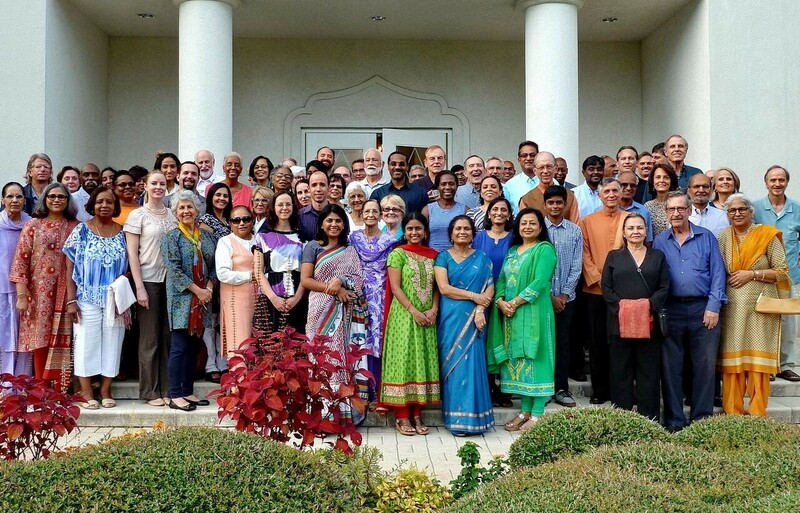 Self-Realization Fellowship emphasizes practice of the techniques of Self-realization scientifically evolved by the saints of India. It emphasizes the fellowship of religionists for truly traveling the inner highway of Self-realization together. 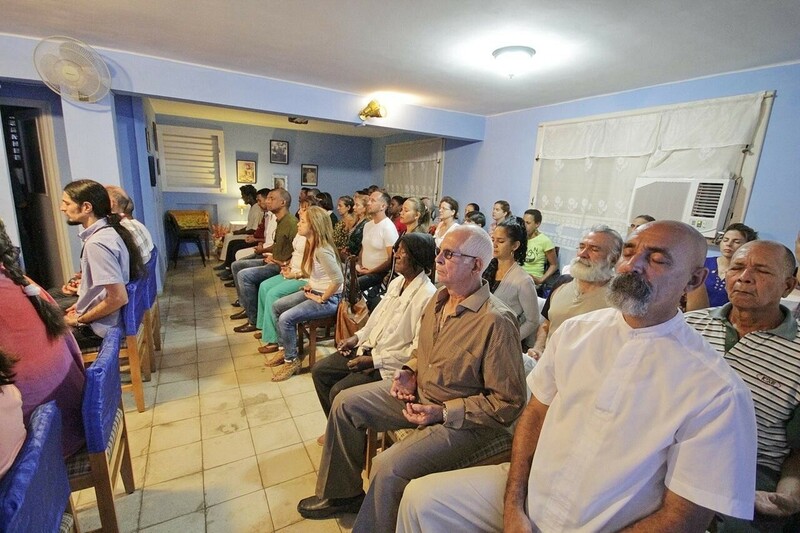 Meditation groups should be organized not for the glorification of a cause or leader but with the express and sole purpose of knowing God by the power of united concentration and meditation. Every soul is a child of God and a reflection of God's will, but by egotism man isolates his will from the Divine Will and thus limits it. By deep concentration in union with other seekers, a devotee transmutes his will into God's Will. Remembering his identity with God, he recovers his divine heritage of God-perception. Every devotee should strengthen his realization of Divine Will through prayer, through God-communion in meditation, and through spiritual company. Jesus said: “For where two or three are gathered together in my name, there am I in the midst of them” (Matthew 18:20). When two or three people get together to concentrate on God, the strong divine concentration of one person strengthens the weaker concentration of another. But people who assemble in the name of the Lord and then chatter, or while outwardly praying think of something else, or mechanically go through the motions of a sacred ritual without inwardly communing with God, will not be able to feel the Christ Consciousness that pervades creation. Group meditation is a castle that protects the new spiritual aspirants as well as the veteran meditators. 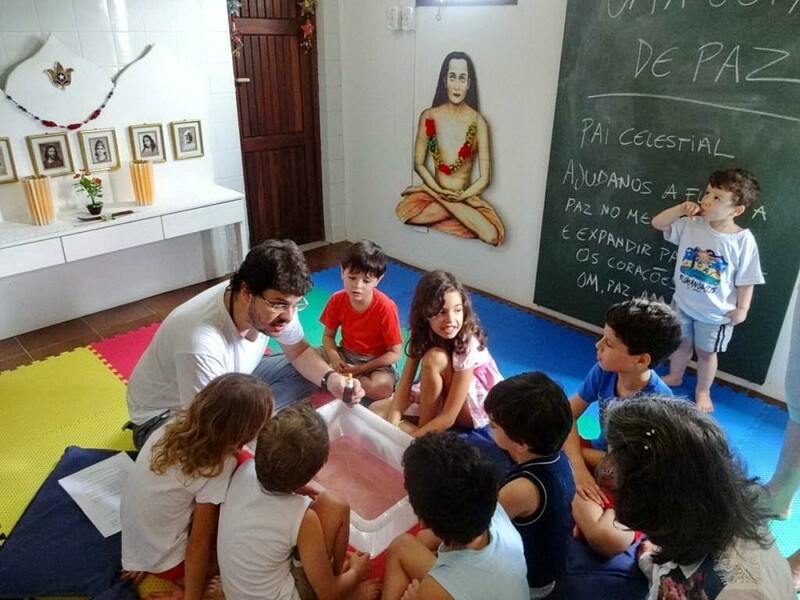 Meditating together increases the degree of Self-realization of each member of the group by the law of invisible vibratory exchange of group magnetism. How true the Guru's warning was! All those who stayed away from the group that I started, even though they had advanced spiritually in Kriya Yoga, later succumbed to worldly influences and to the promptings of their subconscious material tendencies of past incarnations. Those who stayed with the group progressed steadily in God-realization, because we helped one another in moments of weakness and indifference. An overcast of spiritual lassitude sometimes covers the light of the soul, like a quick spread of clouds over a clear sky. We have to banish the clouds by the sunshine of good company. Why shouldn't you strengthen your own vibrations through fellowship with people seeking Self-realization, and by group meditation with them? This practice will fortify your own spiritual convictions; you will find that many seemingly insuperable barriers in your life will crumble and dissolve in the waters of meditation. Your devotion and love for God will commingle with the devotion and love of others. Divine bliss will radiate from you, helping all persons you meet. If your spiritual progress is at a standstill, or is ebbing, the practice of meditation on God or on any of the Great Ones, in the company of other devotees, will uplift you from your precarious state. The proximity of others' spiritual vibrations has the power of raising your own. 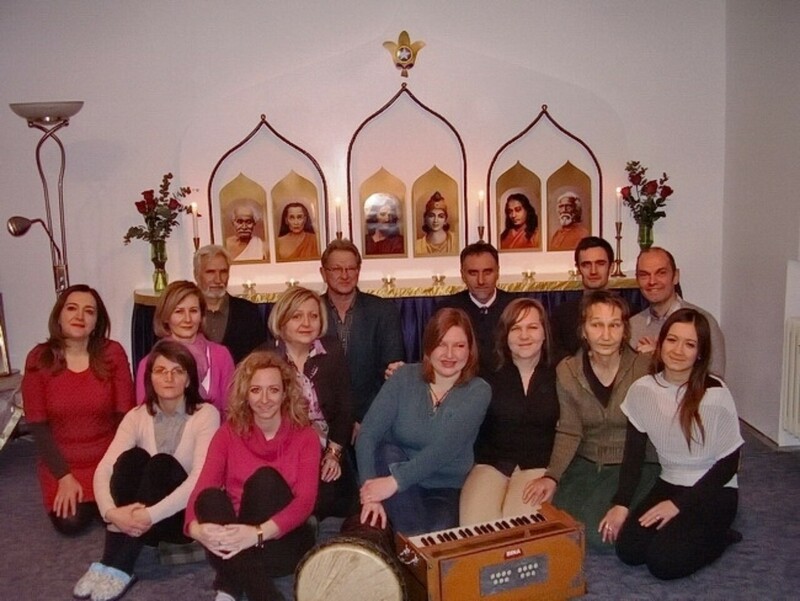 Meditating with other devotees thus helps you to quicken your evolution. They inspire you on your climb up the ladder of Self-realization; and you, by your example, can also be helpful to them. Honey requires a hive. A hive without honey is useless. The East loves to collect spiritual honey; the West loves to build big hives of spiritual organization. To acquire spiritual honey through individual meditation is more important than to build large hives of organization. But some organization is necessary in order to draw devotees together to seek God. If it had not been for the SRF organization, neither you nor others could have received the benefit of the SRF teachings. Always first acquire for yourselves individual Self-realization. But do not neglect the work of your spiritual organization, for to do so would be intensely selfish, and such neglect is detrimental to your soul progress. Hives of organization are needed where the honey of collective truth may be stored to serve hungry brothers and sisters of future times and generations. But remember, religious organization without individual or group meditation is meaningless. Your first desire should be to establish God within, on the altar of your own Self-realization; and at the same time to establish Him in the united hearts of all in your spiritual organization. It makes me happy when even a faithful few hunger for God's infinite love. You were sent on this plane of life to achieve His bountiful love and to serve Him selflessly. This is the only way to liberation, the only way to real happiness. Work for God and meditate on Him every night. During group meetings, meditate with the group members; and when at home, meditate alone or with any other devotee seeking God. The science of yoga will take hold in this age more than anything else. The entire religious trend will be away from churches as we know them and into schools and quiet places where people will go to truly find God in meditation, and not just to hear a sermon. 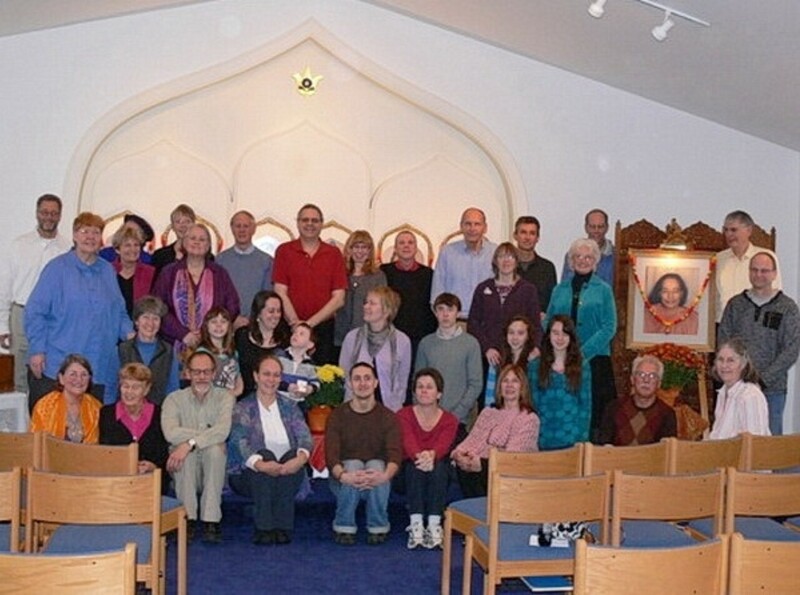 Instead of big costly churches with intellectually trained ministers intent on securing more and more religious “customers,” small meditation centers should be started in quiet places where a few truth seekers will come to meditate and learn the way to commune with God in the company of a few other deeply earnest and deeply meditating persons. 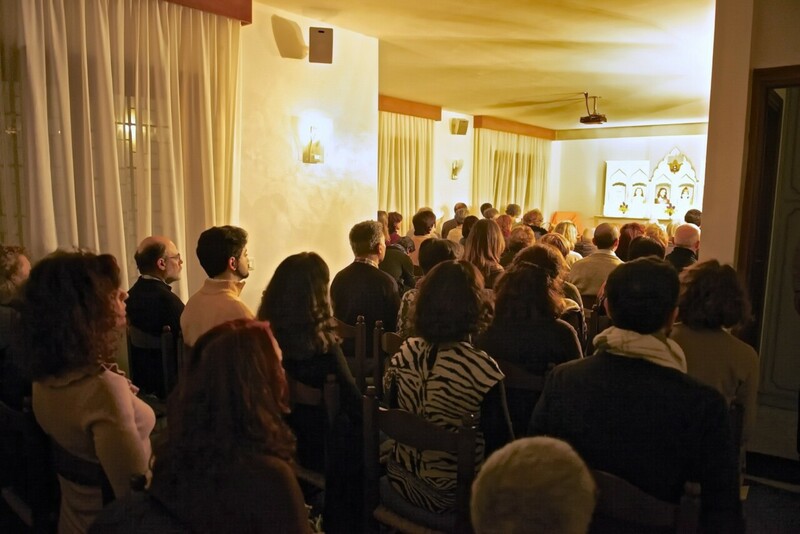 Such groups should not spend their time in listening to one another express their ideas and imaginations about Truth, but should meditate together, using the progressive SRF techniques, thus communing with God and hearing within His sermons of peace and wisdom. The silence of deep meditation should be practiced more in all centers. Everyone should talk less. During my hermitage training in India my guru Sri Yukteswar lectured to us only once in a while. Most of the time we sat around him without any talking. If we even stirred, he would reprove us. Religious groups that merely read good books and pass the time listening to lectures and musical entertainments are theological social clubs, lacking the presence of the Master of Ceremonies of All Life — the beloved Lord. Only groups that meet in the name of God and try to invoke Him in the temple of meditation are truly blessed by His presence. The news of God-realization spreads by itself. That is why group meetings to practice the techniques of meditation are vitally important. Group meetings strengthen the individual Self-realization that one has acquired in private at home. Group meetings give a new awakening to members and impel them to seek the group instead of its having to seek them. 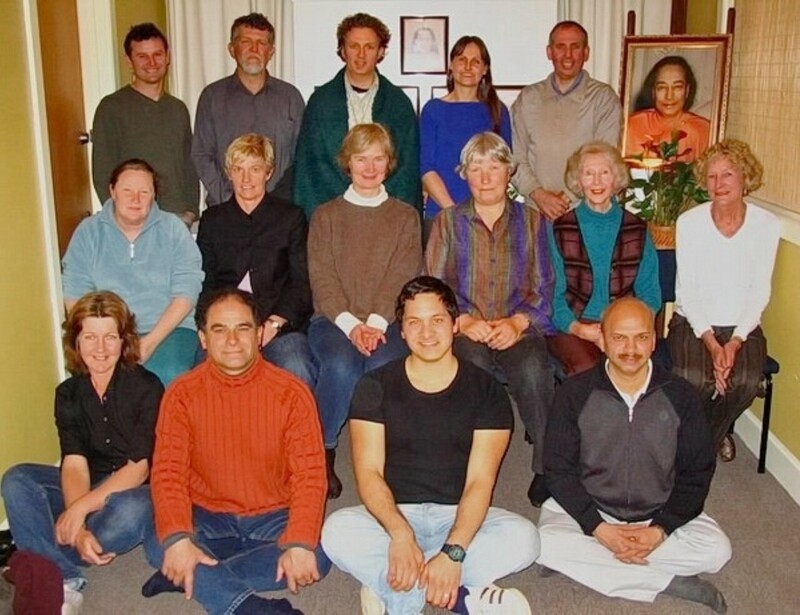 Group meditation holds people together, not because of the leader's personality, or musical programs, or festivities, but because of their own Self-realization. Then, of their own accord, they want to get together often to worship God on the altar of their commingled devotion. United minds are bigger channels through which God's power flows in a mightier way to individual souls. There should be SRF centers for meditation everywhere. My Paramguru Lahiri Mahasaya carried all the burdens and responsibilities of family life, yet never ceased to commune with the omnipresent Spirit. This great Yogavatar, who introduced Kriya Yoga in India and taught it to all receptive seekers, said that the requisites for spiritual liberation are association with a Christlike soul or meditation on him, fellowship with other spiritual aspirants, and the faithful practice of meditation. When you go to an SRF temple or center, let it be for one purpose: to be with God. Do not go for the words, do not go for the singing. Go to feel His presence by meditation! Always keep in mind that when the devotee first starts on the spiritual path, environment is stronger than will power! I want you to know that your presence and efforts are needed. Won't you, therefore, attend your group or center services now, and at all times, and give the center officers your loyal support in every way? I am with you in thought and spirit, for it is the Lord who inspires me to write you thus. Keep your mind mentally attuned to me and to the Great Ones and your life will improve accordingly. Find a temple, center, or group in a community near you.